Come to meet us on our booth! Our agronomists in Bulgaria will attend the International Field Days in Plovdiv. Contact us. 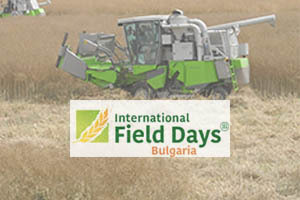 The International Field Days will be a unique and absolutely brand new event facing strong demand among Bulgarian farmers and other agricultural experts. Modern plant varieties, new means of production, improved cultivation methods, live demonstration of agricultural machinery as well as the latest research findings – all this will make the Field Days a unique event.